Garden Landscape rendering. Image Credit: Gensler. Alterations part of larger renovations that will see greater handicapped accessibility, non-hierarchical office organization, creation of a visitor center, and space for associated non-profits. On April 19 2016, the Landmarks Preservation Commission considered and approved an application for work to the Ford Foundation Building, at 320 East 43rd Street in Manhattan. The 1967 building is an individual City landmark, and its atrium is also a designated interior landmark. The proposed work, which will alter the entrances, windows, and the atrium, was driven by programmatic needs, the necessity of code compliance, and handicapped accessibility. Currently, certain entrances to the building and portions of the garden are not handicapped-accessible. Other work, outside of the landmarked atrium will include the reconfiguration of offices in a non-hierarchical organization, the addition of a visitor’s center, an art gallery, and the creation of space for the use of non-profits partnered with the Ford Foundation. The proposed alterations to the building and the atrium were presented by Higgins Quasebarth consultant Bill Higgins and Gensler Principal Madeline Burke-Vigeland. Higgins stated that the proposed work was consistent with the building’s design theme of transparency, openness, and accessibility. A new wheelchair elevator would be installed in the south eastern atrium, and a new pathway would be created along the interior of the 42nd Street facade, currently occupied by plantings, to create a direct route to the lift. Existing entrances would be widened to allow wheelchair access, and two new entrances would be created, all using the same materials as those existing; cor-ten steel, glass, and brass. An existing planter at the 42nd Street entrance would also be removed to make way for one of the new doors. The door is necessary to allow disabled access to a portion of the lobby no elevator is available. Some stairs within the atrium would be replaced with sloped walkways to allow wheel chair users to access different levels. A water feature in the atrium would no longer burble, but be restored to a still reflecting pool. Lighting in the atrium would be upgraded to meet code requirements for a place of public assembly. Non-original railings and a stone wall would be removed from the garden. New operable windows at the loggia would allow for the venting of smoke in the case of an emergency. 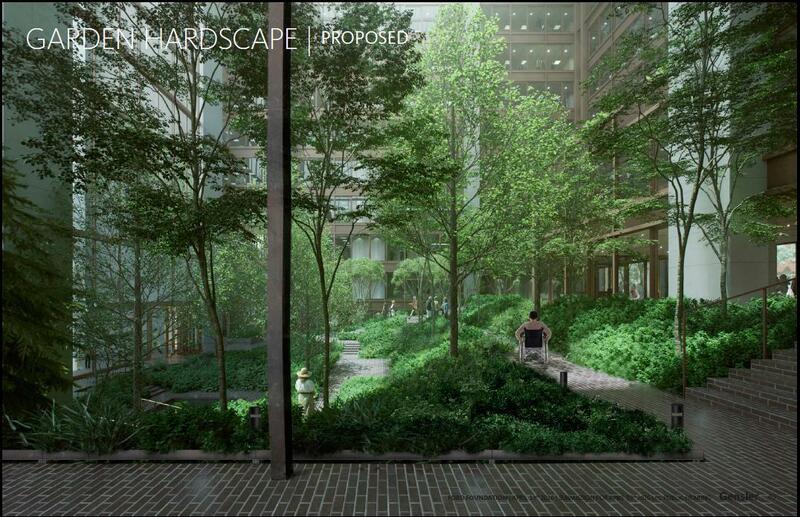 The actual plantings within the atrium would also be replaced. The new landscape, overseen by Raymond Jungles, would restore the diaphanous the quality of the atrium’s that was the original intent, as the plants have grown dense over the past decades. The new plantings will also be of a more temperate nature than those existing. Original plantings of temperate deciduous type did not survive in the atrium’s climate, so existing plants are of a more tropical nature than intended. The atrium’s plantings are not explicitly designated, but the fact of a garden is. Landmarks Chair Meenakshi Srinivasan stated that the commission had received communications in support of the proposal from Manhattan Community Board 6, Council Member Daniel Garodnick, and Congress Member Carolyn Maloney, in addition to multiple other letters. Commissioner Michael Goldblum questioned the appropriateness of the new pathway leading to the access lift, stating that “fuzzy green stuff against the window” on 42nd Street was an essential component of the landmark. He suggested adding a jog to the path to allow for some retention of that aspect. Commissioner Adi Shamir-Baron also determined that the “density of the landscape against the 42nd Street wall is pretty important,” proposed straight line hardscape detrimental to the landmark. Srinivasan asked the applicants to look at the pathway with Landmarks staff, but stated their programmatic desire that two wheelchair users be able to travel the path abreast should not be disturbed. Commissioners voted unanimously to grant a certificate of appropriateness. LPC: Ford Foundation Building, 320 East 43rd Street, Manhattan (18-0251) (April 19, 2016) (Architects: Gensler).